The Senator made us laugh and then took on our biggest problems. What do we do now? 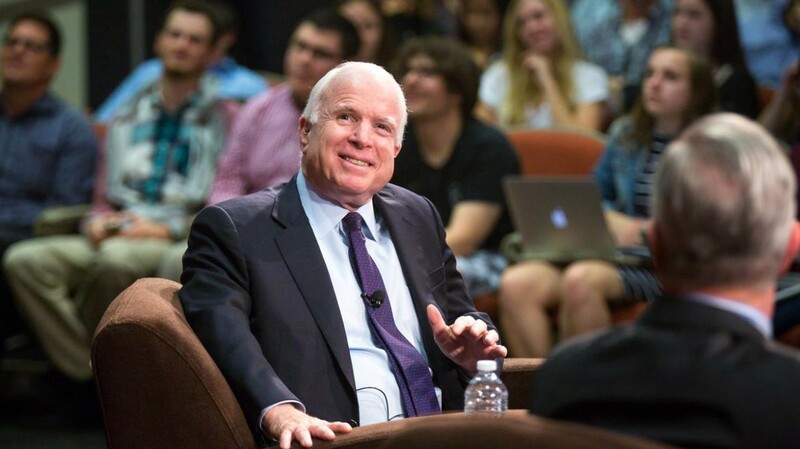 In 2016, I invited the Senator to come to Arizona State University to be the subject of my YouTube interview series in front of a student audience. It was during the middle of his reelection campaign, and he wasn’t feeling the love: “it’s going to be a tough one, Jeff, right down to the wire,” which, of course, he won by 6%. McCain survived more than insults. He outlived plane crashes, POW prison and torture, and over three decades of Washington D.C. Throughout his storied career, from the time he jumped into a Navy cockpit in 1958 to becoming a senator in 1986, the most palpable part of his legacy was that America was his first love, and nobody adored her more. ‘Six degrees of separation’ was a phrase that could have been invented to describe McCain’s network, which ultimately included me. I met the Senator through a man McCain adored, Michael Crow, ASU president and America’s profoundest education philosopher, and a protégé, former NATO Ambassador, Kurt Volker, who runs the McCain Institute. My induction ceremony was listen to jokes, laugh, and if you like bird watching, better. McCain had no illusions about the world we live in. Humans are capable of shocking, horrible things. He was Lincolnesque in this way, his enemies hated him dearly because his sheer good nature and candor inspired victories over the bad guys. The result was a lifelong Quixotic battle in which he stockpiled American values and carpet bombed opponents with humor. Every spring, McCain would host the annual Sedona Forum at his McCain Ranch, a typical McCain hoedown where Davos mingles with High Noon. The guest list would make Queen Elizabeth jealous. Flake was right. The McCain Ranch didn’t have cattle or sheep. But ranchers mend fences and fix things that are broken, so McCain was a rancher. There were so many things McCain wanted to fix, and he spent 60 years working on a punch list. It included North Korea’s Kim, “the rotund ruler,” and women getting raped by human traffickers in Moldova, “the evilest thing you can imagine.” McCain wanted to help the Kurds’ quest for an independent nation, “the largest ethnic community in the world without a country.” His passions ranged from terminating ISIS and helping refugees, to putting Putin and Syria in their place. If you could help him take care of our Veterans or educate Arizonans, he was your best friend. In the same spirit, he stood up to bullies, which of course, is an old rancher term. He came down hard on China’s Xi for imprisoning opponents to remove political obstacles. But he also criticized Obama for pulling out of Iraq prematurely because the polls said so, which opened the door for ISIS. He thought Trump was deeply flawed. If anyone had a right to blast Trump, it was McCain, but he had an aviator cool. His comments were measured and he left the door open. That Trump didn’t take the opportunity is one of the saddest moments of the 45th president’s choppy tenure. Trump could have learned a lot from McCain, including a few jokes. Winston Churchill said history would be kind because he intended to write it. McCain had the same philosophy. He published six history books, and the last one just came out in May. It is titled The Restless Wave: Good Times, Just Causes, Great Fights, and Other Appreciations. The book is filled with reflections about power and geopolitical insights. It will be a difficult read for sentimental reasons, but there will be a lot of laughs.